Hello creative friends! 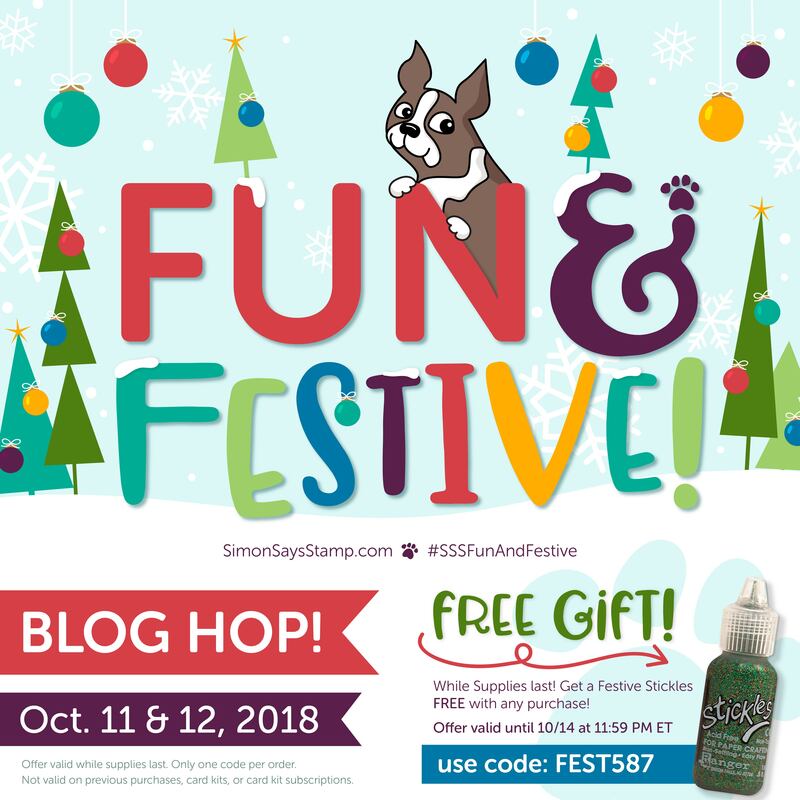 Happy Fun & Festive Blog Hop day! 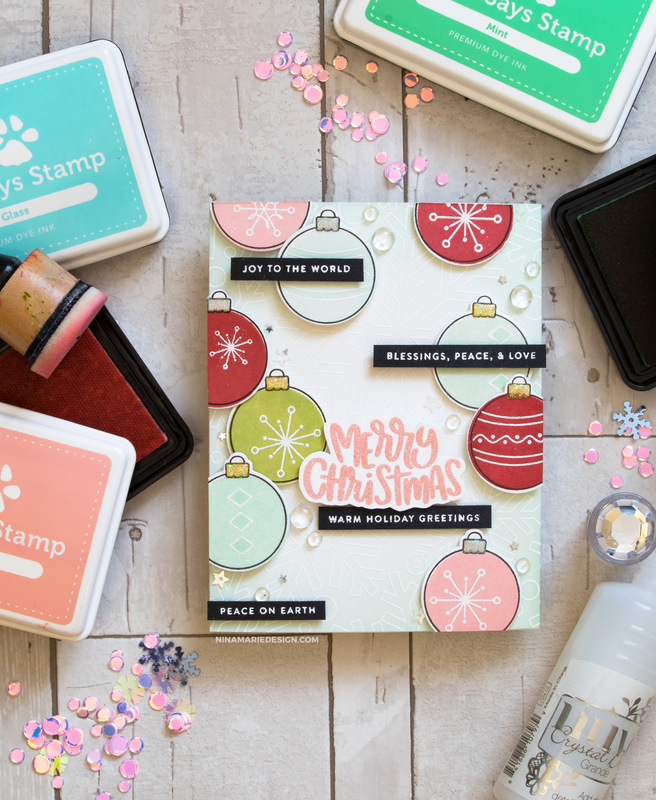 Today Simon Says Stamp is celebrating the release of their latest collection of exclusive products with day one of a two day blog hop. I am very excited to be part of day one’s celebration and I hope you will hop along to see all of the other gorgeous inspiration that is being shared! If you have already been hopping along with us, you should have arrived from the amazing and oh-so-sweet, Laura Bassen’s blog! You can reference the entire hop list at the Simon Says Stamp blog. This festive card features many of the products included in the latest Simon release, such as: the Ornamental CZ Design stamp and die set, sentiments from the Critter Sweaters and Tiny Words Christmas sets, a background stamped with the Outline Snowflakes cling, and even some star sequins that I pulled from the Christmas Magic mix. I stamped the ornaments with Willow, Lipstick Red, Rosie Cheeks, Mint Candy and Sea Glass inks from Simon. 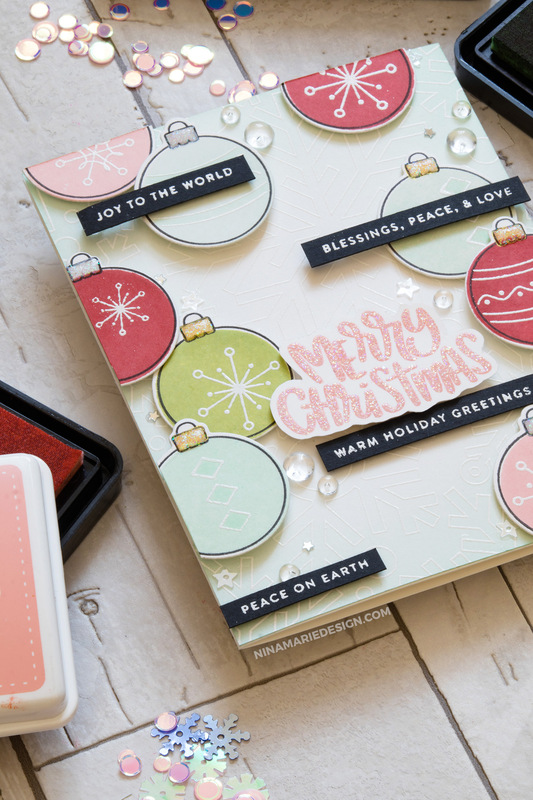 They are arranged onto a white card base that is white heat embossed using the Outline Snowflakes cling; with the emboss resist technique, I blended Mint Candy and Sea Glass inks around the edges for some soft, subtle color. The greetings are embossed too; I used Rosie Cheeks ink and Singing in the Rain glitter embossing powder from WOW for the Merry Christmas. The smaller sentiment strips are white embossed on black cardstock with the Tiny Words Christmas set. Finally, I added embellishments around the ornaments; a mix of silver confetti stars, stars from the Christmas Magic mix, and Clear Droplets. 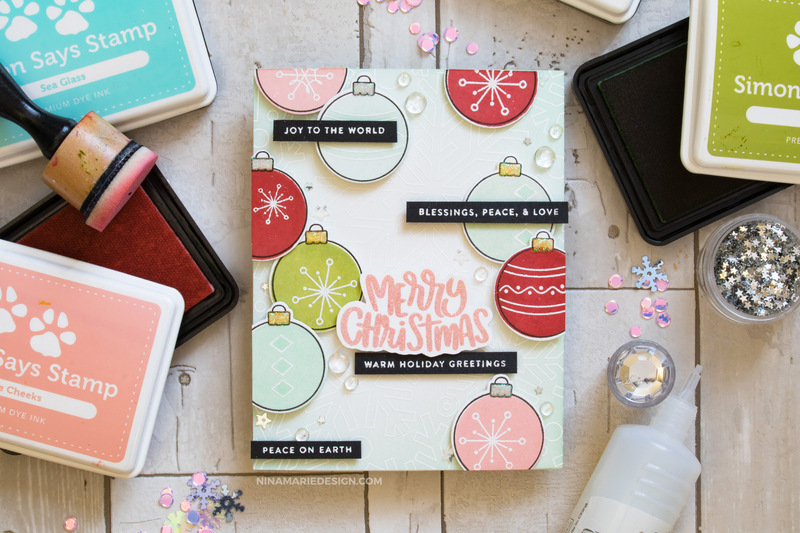 I really love the modern feel of this card, as it carries both a fun and festive vibe that is fitting for this release and blog hop! 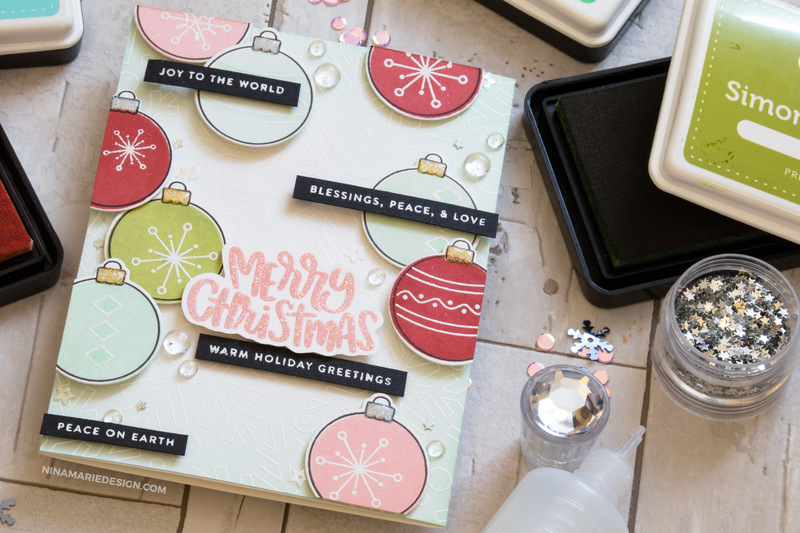 I hope you will watch the video to see this card come together, and be sure to participate in the hop to see even more FUN and FESTIVE inspiration! Thanks so much for visiting me … Happy Thursday! There is lots more inspiration to be seen along this Fun and Festive blog hop! Your next stop is the ever-amazing, Amanda Korotkova! You can visit the Simon Says Stamp Blog to see all of the stops in this hop. Simon is generously giving away a $25 gift card at each stop of the hop! Simply leave a comment below for a chance at being a randomly drawn winner! Winners will be chosen over the weekend and posted on the Simon Says Stamp store blog on Wednesday. There is also a FREE GIFT offer valid while supplies last! Use code FEST587 at checkout to get a free bottle of Festive stickles! It’s gorgeous Nina-Marie, I love the modern look. Sometimes you must see something first before you can like it, that was with this colour combination also, but it’s gorgeous. Thank you for so much for your time and effort. Fabulous card! And fabulous release! I love ornaments on cards! Love your ornament card its stunning. Love the scattering of the ornaments. idea and the colors are great. I really enjoyed your video. Your card is so lovely. I’m glad I ordered that snowflake background stencil. It’s beautiful! Love the colors you chose for your ornaments and the subtle background! LOVE this card! The bright colors just make it so fun and festive. Thanks for sharing! I love your card Nina ! Just perfect for christmas gift ! I love ! Love this Fun & Festive release! Love those pretty ornaments! Awesome card! Love how you embossed this entire card. Very clean and modern. Love all the layers but still comes out clean and crisp. Nice work. Great card! Love your colors. A super card! A clever way to use those smaller baubles which look great against that subtle embossed background. Thanks so much for the inspiration! Beautiful card — it’s a very happy card! This card is fantastic! I love the color combinations!!! Darling! I like the way you colored the Merry Christmas.